[INSPIRATIONAL] John Glenn Adam (a 3:27 marathoner) sempat kenalin saya ke Peter Courogen, seorang Ultra-IronMan yg sedang di Jakarta utk 3 tahun ke depan. Awal bulan ini (September), Peter dan team-mate nya Julie Leasure, baru menyelesaikan GORETEX TRANSALPINE-RUN 2013 (jarak total 261 KM dan total elevation/nanjak 15,879 meterrrrr) di Eropa. "Peter, it's not everyday we get to meet face-to-face with a solid sub-3 hour marathoner and an accomplished multiple IronMan finisher (sub 10 hour!). Most importantly though, you seem to be an all around great guy. I want to thank you for agreeing to share some of your experience, running and otherwise, to encourage more people to pick up and/or continue running. I run for a variety of reasons. I run for the enjoyment of it first and foremost. This enjoyment has many different layers that range from health & fitness, stress management and sanity, to the social aspects or camaraderie, to the more competitive aspects of racing, like accomplishing new personal record times and distances. I like the time efficiency you can get a workout in, and the convenience of being able to run most any time of day, or anywhere in the world that you go. Preparation, cleanup, and investment in equipment is quite minimal compared to some of my other sports. ---When did you start running? And what are your personal running milestones since then? I first started running in 1981 as a Field athlete on my Track & Field high school team, in Portland, Oregon USA. Being that I have always had a body type more like a Rugby player (Team Chubby certified! ), I was initially steered by coaches towards the Shot, Discus, and Javelin in 9th grade. As the season progressed, I got more and more into the 1-mile warm-up the whole team would do before practice started. By the end of that season, I started my transformation from field athlete to 800m runner. Over the course of the next 8 months, I went from an 800m runner, to Varsity Cross Country running the 5K, to finishing the Seaside Marathon at the age of 15. I spent the next 3 years running high school Cross-Country and graduated to longer distances on the track, like the 1500m and 3000m. At a high level, my milestones have been finishing my first marathon at the age of 15 (3:14), finishing my first Triathlon at the age of 16, winning my first of many Triathlons at the age of 18 throughout my mid-20’s, finishing my first Ironman Triathlon at age 27, achieving my fastest Ironman time at age 29 (9:43), my fastest marathon time at age 39 (2:44). My fastest marathon since the crossing into the 45-49 age range was 2:53 at the 2011 California International Marathon, also winning the Clydesdale (Team Chubby!) division for those runners over 200 pounds in weight. The marathon distance was the longest running distance for me until I reached my mid-thirties, when I started doing a few 50K ultra-runs, which then evolved to several 80K runs, and capping out at 100 miles at Leadville in 2012. My marathon races range from multiple Portland Marathons, Boston, New York, Death Valley, Honolulu, Las Vegas, Los Angeles, multiple Motorola Marathons, and multiple California International marathons. ---What's your Personal Bests, for a 5K, 10K, Half Marathon, Full Marathon, and the Ultras and IronMan? Realizing that many of these times happened nearly 20-30 years ago when I much younger and still had some speed, my best time for 800m was 2:00, 1500m was 4:08, 3K was 9:12, 5K was 15:40, 8K for 25:50, 10K was 32:32, 15K 51:30, 21K was 1:15, Marathon was 2:44, 50K 3:40, 50M 7:11, and Ironman 9:43. ----How many marathons/ultra/ironman events have you participated in, and what's the longest event (in terms of time), and can you share what went through your mind for such long journeys, and were there any point in which it was particularly challenging? Which one of these is most memorable, and why? So many events, that I have lost count of marathons, especially if you include many training runs, ultras, and adventure races which were longer than marathons, over the last 10 years especially. If I had to guess, I would say it’s ~200+ times over my lifetime I have pushed beyond the 42K mark in any one running outing, starting in 1981 with some of my training runs preparing for my first marathon. I have competed in the Ironman 18 times on various courses throughout North America, going to the Hawaii World Championship three times. The longest event by far would be in Adventure Racing, doing distances of 800K over the span of 8-10 days almost non-stop, but always resting and eating on the clock. Although with adventure racing there are other modes of transport such as mountain biking, mountaineering, kayaking, and horseback riding to split things up, there are a few races where we had over 300K, several days where we covered 80K in one push in the mountains. The longest adventure race took our team almost 10 days, with the race course closing just 20 minutes after we finished. If you’re talking more conventional running, then my longest single distance event would be the Leadville 100 done in 2012, which took me just over 29 hours. I had some pretty dark and troublesome moments during that race. Being that the whole race happens above 3000m, there were times where I couldn’t keep any food down. I ended up going to the medical aid tent at mile 60, and taking a 3 hour nap to pull myself together (on the clock of course), but was able to pull myself together and do the last 40 miles…. one step at a time. There are some times in races where you feel like you’re on cruise control with the miles float by you effortlessly, but there are other points where you have to work and focus for every small step that you take. Many of the times your training about putting yourself in situations where you’re developing and building coping mechanisms and strategies based upon where you are in any race, and dealing with whatever elements are thrown at you. My most memorable events are usually the ones where you either have an all-time best performance, win overall, or the ones that leave an indelible mark on you, where you had to dig so deep into your reserves just to finish. I think many athletes are defined more by you failures and their ability to cope with adversity than by victory. All my Personal Record races, or races where I won overall when I was younger, I remember pretty well but try not to live in the glory days of the past too often. I also remember the races where the medical crews were trying to pull me off the course, races where I had to cope with nausea and dehydration, races where the course or weather conditions became so difficult, that most everyone quit. Usually, when things get really ugly is where I tend to rise to the top, and find some way to get it done. ----What is your biggest running achievement (doesn't have to be race related)? My biggest achievement has always being able to find balance in all aspects of my life and to find ways to remain inspired and motivated throughout my 32+ years of running. With a very demanding job, a wife, and 4 kids definitely gives me perspective and forces me to maintain balance, prioritizing things that need to get done before the fun, otherwise it simply wouldn’t happen. ---Despite the boom of ultras, the marathon (26,2 miles) still remain the gold standard for runners worldwide. How many marathons have you participated in, and which one is most memorable, and why? As above, too many to count really. I am not much one for counting once you get above say 20 times. If I had to guess, with all the different kinds of races I have done I have met or surpassed the 42K mark over 200 times, but many times in training, during an Ironman, on a mountain training run, or on my way to an Ultra distance or adventure race finish. Of the times I have RACED the marathon, the most memorable ones were the Motorola Marathons in Austin, Texas. I did that race for a few years because of the time of year, a good sunny winter destination, and the fast nature of the course. That’s where I set my two fastest marathon times of 2:44:06 one year (2004), and then again in 2:44:03 a year later. Both of those years were cool and fast years, and I had a couple of colleagues to train and race with those years. Given that my fastest times are well behind me for sure, I get most motivation by focusing in front of me rather than fixating on the times of the past, that I will never see again. I look for new distances and new race venues to share in the experience with family and friends. My motivation are more destination, experiential, and a bit of age-group competition related though that can be very competitive at times….always looking to maintain balance and perspective in my motivation. ---What's your most recent running event? And what's the freshest perspective that you got from that event? I just returned last week from the Gore-Tex Trans Alps Run, which is an 8 day trail running stage race through the Alps going from Germany through Austria, Switzerland, and finishing in Italy. Each day was a different distance on different mountains, but the cumulative distance was 260K, with 16K elevation gain and 16K elevation loss over the course of 8 days. It is a “2-person team” event in that you have a teammate to run along with you for safety and sanity purposes, but both runners do the whole distance together, and must remain no more than a couple minutes apart throughout the race, otherwise heavy time penalties are given. Twenty-seven countries were represented from around the world. I ran for the USA Nike/Gore-tex Team with a colleague from work, who is a good friend and training partner from back in the States. We ran in the youthful Open Mixed Division which initially had 104 teams to start, but after a bit of attrition, by the end of the race we were ranked 16 of 78 teams that remained. Most of the teams had a combined age of less than 55-60 years, whereas we were a combined age of just under 90 years without a masters’ division available. My freshest perspective is on several levels. One perspective is how beautiful the Alps are being my first time ever running there, but also how brutally technical and unforgiving its terrain can be. Having completed the TransRockies Run in the USA on four separate occasions which are much higher in elevation than the Alps, I can say that each stage of the TransAlps was so much more difficult, even at lower elevations because of the technical footwork required throughout. There were areas of the course that our adventure racing experience in high exposure and high alpine technical terrain definitely paid off. Coming straight from Jakarta to that kind of technical high alpine terrain was quite hard for me, especially the first few days as I was still acclimatizing, but eventually I hit my stride and got stronger as the race progressed. Another perspective is that the ultra-running sport is gaining momentum quickly and being taken over by youth. There are many young runners that are dominating the sport who have never run a pavement marathon. Here I am as a sub-3 hour marathoner being crushed by nearly 2 hours over the course of 35K in the mountains by these young 20-something runners, and they have no idea what their “marathon” time is because the typically only run on dirt and rock. I think this trend will continue and that ultra-marathons will continue to be taken over by youth that have focused only on trail their whole life. Gone are the days of ultra-marathon running being done after the proving yourself in the marathon. These young runners are in a sense “trail running specialist” who live and train in the mountains year around in all conditions whether snow shoeing or alpine skiing, where as those runners with only road running experience will find themselves very much at a disadvantage on this kind of terrain. Dream Big, but set realistic goals to set yourself up for success. Progress gradually, keep balance in your life, listen to your body, and that the recipe for success is a very individual thing. In general, my goal is to have fun and enjoy all that the sport brings on many levels from the competitive aspects, unique race destinations, camaraderie, coaching and advising others along the way. Running has been such a large influence in so many aspects of my life, not only from a training and racing perspective, but also igniting many other areas such as my advanced degrees in Biomechanics & Exercise Physiology, to my 20 year career in the Footwear Industry. I enjoy sharing all aspects of what running has provided me in enriching my life. My own personal running and race goals are done on a yearly basis. Being that I am 2 months new to Indonesia, I would like to experience some of the shorter races locally and learn more about the fantastic community that surrounds me. That may take a while, but after that I may start to branch out to experience some of the races in the other regions outside of Java, and then branch out further to other Asia countries. I am planning on being here in Jakarta for the next 3 years, but there are many events so I will need to choose wisely! ---Who are your favorite runners, and why? The most influential runners in my past would be Steve Prefontaine and Alberto Salazar. Being from Oregon, I was surrounded by the mystique and success of these local running heroes. Both runners went to the University of Oregon, in my home state and were the best runners of their time. I watched Alberto Salazar set the world record for the marathon (2:08:13) on our family television and right then wanted to be just like him. He was the inspiration behind me aspiring to run the marathon at the young age of 15. These were my favorite runners because both Alberto and Pre were unconventional in their approach, they thought for themselves, and overcame their obstacles often times through sheer grit and determination. They simply willed themselves to win and showed the world that nothing else mattered more than determination, hard work, and the willingness to give your absolute best every time you toe that starting line. ---Describe your favorite shoe (can be imaginary, or one already on the market)? Given that I have worked in Footwear Development for 3 different brands over the last 20 years, this answer to this can become tricky on many different levels! I would say my imaginary (ever illusive) perfect shoe would be one that allowed your foot to move as naturally as possible to the point where you would forget you were wearing them, provided just enough protection from the elements to stay injury free, and just enough traction to ensure never a misstep or slip on whatever surface you ran on." 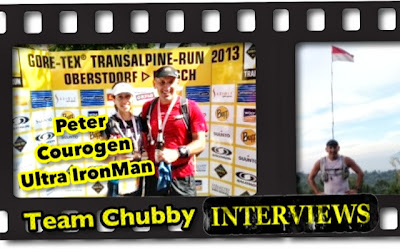 "So glad to join Team Chubby as I have been “chubby certified” most of my running life! Looking forward to meeting and running with you all one day soon! See you out there on the roads of Jakarta!"